If you need to keep your instruments out of the reach of toddlers and pets, or maybe just want to conserve some good 'ol floor space, the Pro-File Wall Mounted 4 Guitar Hanger is your best bet. This cool-looking display piece is handcrafted and American-made. It features beautifully engraved maple hardwood, highlighted with a bronze color fill. And a custom-rosette inlay and attractive V-grooved F-Hole motif. 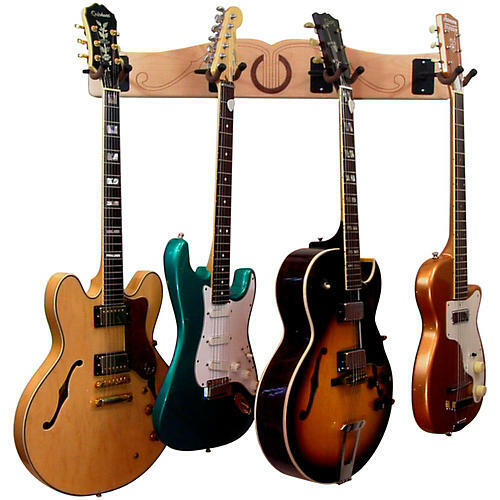 Each of the four guitar holders is angled to conserve even more of your wall space. And they’ll accommodate your electrics (hollow or solid body), acoustics, basses and banjos too. All mounting hardware is included. Consolidate your collection, save floor space and get a nice piece of furniture too. And if you’re a searching for a great gift this Christmas, an anniversary, birthday, etc., you’ll be sure to knock it out of the park this year with the Pro-File.